Another day, another round of leaks from White House sources who seem intent on airing each other’s most embarrassing moments to the media as part of an ongoing internal power struggle within the unstable Donald Trump regime. This time it turns out there appears to be at least one person with reasonable views within Trump’s cabinet who’s willing to tell off Trump’s pet nazi Steve Bannon to his face. And that man is General John F. Kelly. Retired General Kelly is the new Director of Homeland Security, having been one of Donald Trump’s very rare non-controversial nominees, and having already been confirmed by the Senate. 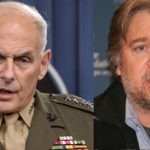 Trump’s Muslim ban executive order, which was largely the handiwork of Steve Bannon, by all rights should have been run past Kelly, as his agency was going to be partially tasked with enforcing it. But that didn’t happen, and after the order led to a chaotic day of innocent Muslims being held prisoner at U.S. airports and thousands of protesters showing up on their behalf, Kelly decided to try to right the wrong. It’s worth pointing out that White House Press Secretary Sean Spicer is now denying that Bannon even went to Kelly’s office, let alone that Kelly told him off. But Spicer has such a documented history of lying in his role as press secretary, his word virtually worthless here, and we’re inclined to include that the story is in fact correct. Meanwhile, Democrats in Congress are working to legally ban Steve Bannon from the National Security Council.